You can import your data into SpatialKey in multiple different ways. Let’s explore these different import options to see which makes the most sense for your data. The Data Upload Wizard is available from within the SpatialKey application and allows users to import CSV or shapefiles. The upload wizard can be triggered a couple different ways. Detailed steps can be found in this article on the Data Upload Wizard. If you want sample data to try it out, check out our Sample CSV Data files. On the Datasets tab, click on the “Add New Dataset” button and select the “Upload Dataset” option. In the Datasets tab, click on the gear icon to view data settings and select the “Manage Data” option on the left side of the screen. After selecting to “Append records” or “Replace records”, the upload wizard will appear, helping you through the import process. An abbreviated version of the Data Upload Wizard is also available in select apps (e.g. 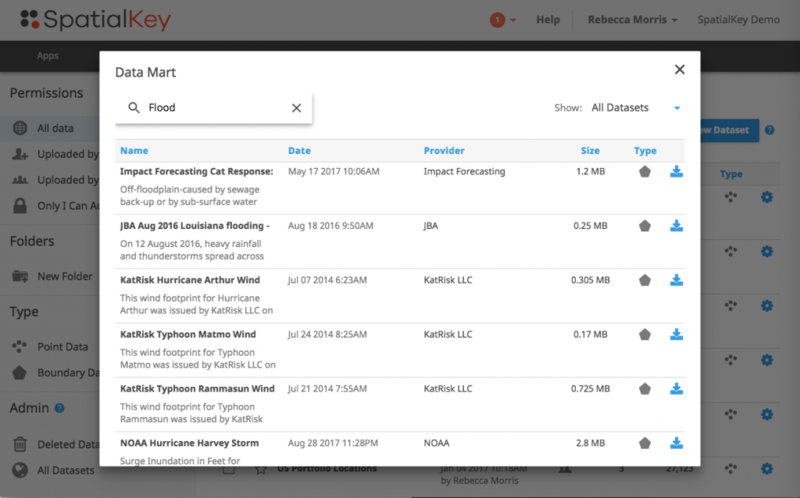 Flood App) within SpatialKey to help you get your data loaded quickly for a specific purpose. If enabled for your organization, there is also an upload wizard specific to policy data that will be used for policy exposed limit calculation. This policy file upload wizard is triggered in a slightly different way – check out the policy file upload article for more details. If enabled for your organization, you can view and select datasets to import from the Data Mart. The data mart contains datasets that are meant to be shared. 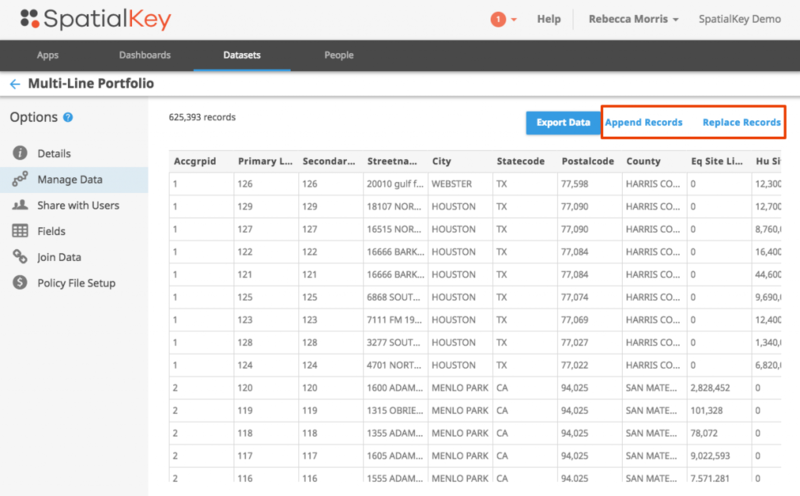 Importing a dataset from the Data Mart will import the dataset into your Datasets list so you can interact with it in SpatialKey. On the Datasets tab, click on the “Add New Dataset” button and select the “Browse Data Mart” option. To upload a dataset from the Data Mart, find the dataset you are looking for and click the blue “import” icon. For more information, check out this article on the Data Mart. The data import API is a simple HTTP based interface that allows developers to programmatically import data into SpatialKey environment. Contact us for more information on the Data Import API. No programming knowledge? 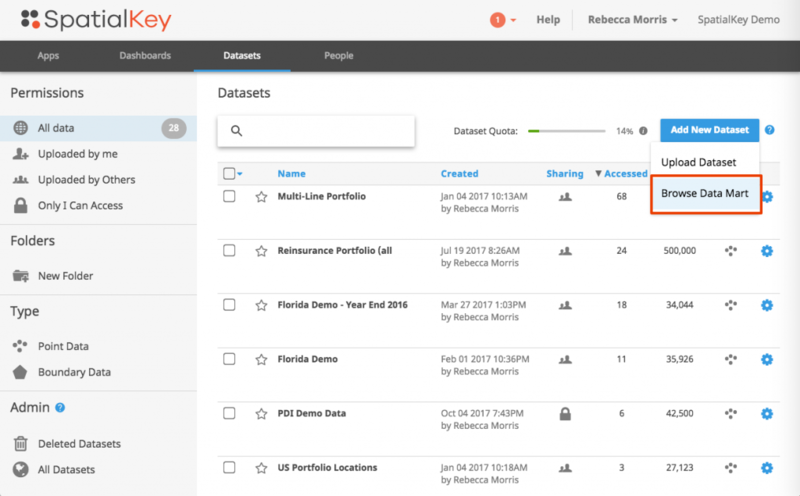 You can leverage our API to create and update data in SpatialKey with the Data Management API Command Line Tool. Contact us for more information on the Data Management API Command Line Tool. SpatialKey Bridge ETL is a user-friendly app that sits on a user’s desktop and does the work of converting and uploading RMS EDM information for use in SpatialKey. Historically, insurers developed custom transformation queries to manually extract data for further analytic processing within SpatialKey applications. Now, it’s as simple as installing the application, pointing to your SQL Server and selecting one or many portfolios from your library of EDMs – the rest is automatic, and insurers will have ready-access to their exposure data. Contact us for more information on the SpatialKey Bridge ETL.